Learn the basics of making earrings. The only limit is your imagination, you can use gemstones, glass, Swarovski and or seed beads for beautiful designs. 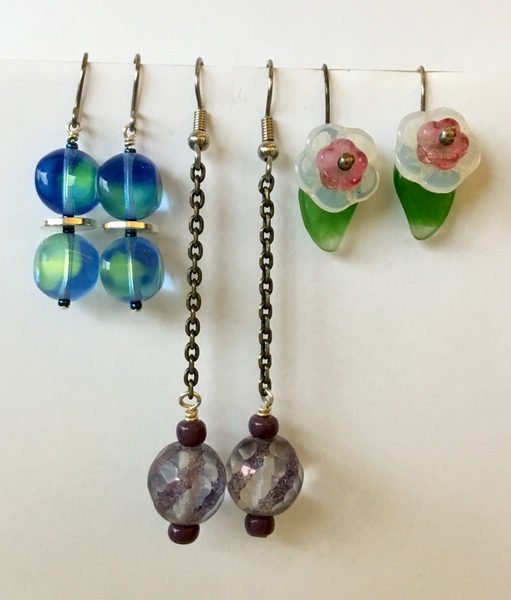 You will learn how to make three different styles of earrings and basic wire twist connection. All supplies are provided in class including base metal ear wires. Click for map & directions. Students will receive a 20% off one total purchase coupon on the day of class, good for use at Harlequin Beads & Jewelry (in store only). Pre-registration & payment is required to save your space. Please register online or visit or call the store to sign up for a class. Cancellations for credit are accepted up to 5 days in advance of the class (so we can fill your space). Harlequin Beads and Jewelry specializes in Swarovski crystal, pendants and pearls, Czech glass and seed, Japanese seed and gemstone beads, plus a full selection of stringing supplies and jewelry findings.